The instructions in this section have been verified with domains and emails hosted on servers of BONISOT with Microsoft Outlook Express 6. Maybe that these do not work with earlier or later versions of Microsoft Outlook Express. How to setup email in Microsoft Outlook Express? Go to tools &gt; accounts. Click the Add button &gt; and select the mail item. Enter your name as you want it to appear in the messages you send and click Next &gt;. Enter your email address and click Next &gt;. If you want to keep copies of messages on the server, select IMAP. If you don't want to keep any messages on the server, select POP3. If you select IMAP, also you can train the SpamAssassin spam filter based on received messages, whenever SpamAssassin is enabled on the server. In BONISOFT, we recommend you select IMAP, but each client decides how to configure your email account. Incoming mail server. Enter the Internet address of your web site. Outgoing mail server. Enter the Internet address of your web site. The name of your account. Enter your email address in the account name box. Your password. Most likely, this password to match the password used to access the Panel. Checkbox to remember the password. Leave this checkbox selected if you want not to be asked your password each time that your e-mail client connects to the server to check for new mail, and click Next. 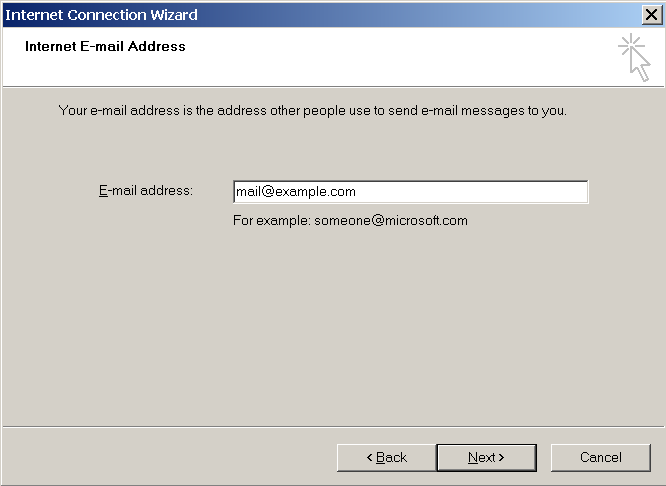 How to configure e-mail with Microsoft Outlook Office 2010? Go to file &gt; Info &gt; add account. Select the manually configure the server settings or additional server types. Then click Next. Type of account. If you want to keep copies of messages on the server, select IMAP. If you don't want to keep any messages on the server, select POP3. If you select IMAP, also you can train the SpamAssassin spam filter based on received messages, whenever SpamAssassin is enabled on the server. Incoming mail server. Enter the name of your domain. For example, example.com. 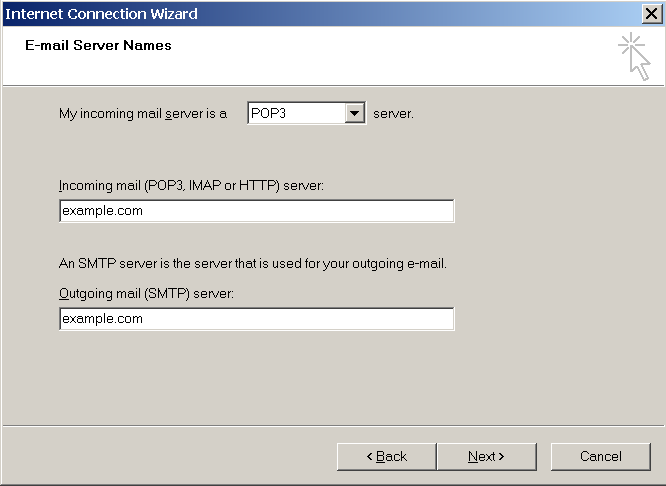 Outgoing mail (SMTP) server. Enter the name of your domain. For example, example.com. User name. Enter your full email address. Example: johndoe@example.com. Password. Most likely, this password to match the password used to access the Panel. It requires access using Secure Password Authentication (SPA). Leave this option deselected. Click on more options, go to the outgoing server tab and select my outgoing server (SMTP) requires authentication. The instructions in this section have been verified in Mozilla Thunderbird 12. Maybe that these do not work with earlier or later versions of Mozilla Thunderbird. How to configure email using Mozilla Thunderbird? Go to tools &gt; account settings &gt; account actions &gt; add mail account. Your name, as you want to appear in the messages you send. Your email address and password. 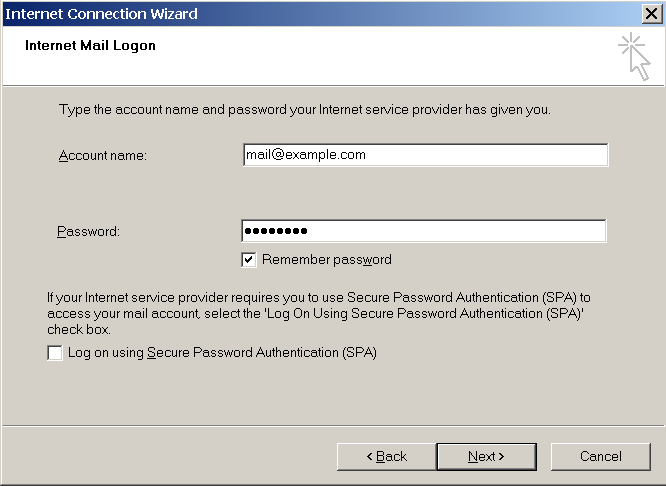 If you have configured an email account manually, use the following typical combinations of security settings of connection and authentication method. If the options do not work in your case, request the right combination from your hosting provider. User name. Your full email address. For example: comercial@bonisoft.com.